My ancestors, and the ancestors of most of the Lebanese in this country, were dark, accented, smelly,1)Added 2015.12.18: I got some push-back about the word “smelly.” It’s not the same as ‘stink’, it simply suggests a smell that is “off”, i.e., foreign. My grandmother smelled faintly of onions, thyme, and sometimes of the pungent cheese she made. She was a very clean woman, she just smelled different from other Americans. If you don’t like the exotic, you might have found the smell offensive. Syrian immigrants. Granted, they were Christian; but many were Greek Orthodox at a time when Catholics and Protestants didn’t even speak to one another. And they were immigrants when immigrant anarchists – anarchists from Christian countries – were committing acts of terror in the US. I can’t imagine many people wanted the Syrian immigrants around back then, any more than they do today. 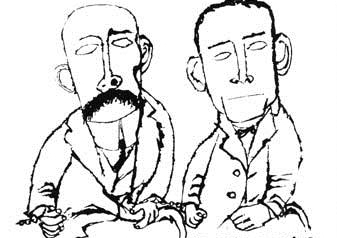 The picture above is of Nicola Sacco and Bartolomeo Vanzetti, immigrant anarchists who were executed for murder in 1927. In the early 20th century, the country was gripped with a fear of anarchism: in 1901, anarchist Leon Czolgosz assassinated President McKinley, and in 1919 the country suffered a series of anarchist bombings. In a fascinating parallel with today, American anarchists were overwhelmingly peaceful, but were persecuted for the crimes of a few. And of course, only a tiny minority of all immigrants were anarchists. There is still much controversy about the trial and guilt of Sacco & Vanzetti, and they were Italian, not Syrian immigrants. But the crime for which they were convicted took place in 1920, a year after my father was born in my own hometown of Sulphur, Louisiana. I have often wondered how the fear of immigrant terrorism added to the problems of his childhood. My grandmother was an illiterate, penniless widow struggling to raise 8 children through the Great Depression, and the two oldest siblings, my father and his sister, had to scramble to find whatever odd jobs they could. I have to believe that the fears of the day only heightened discrimination against all of my relatives, in a period that was hardly tolerant. After Danny Thomas became a star, most of us converted, we went from Syrian to Lebanese. But I think those Syrian immigrants have turned out OK. People think there are a lot of Lebanese in Acadiana and the Lake Charles area, but it’s not true. 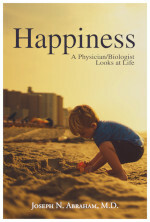 It’s just that so many of us are prosperous doctors, lawyers, teachers, and successful merchants, and many of us are involved in civic leadership. All over the region there are prominent businesses and public buildings that carry Lebanese names, and our current and previous Congressmen are both Lebanese. The south Louisiana Lebanese are even married into the Kennedy family. (It’s a fascinating story that starts with the 1956 Democratic National Convention, I may tell it some time). There is an irony to all of this, of course. Despite the struggles of our ancestors, I was surprised to find that some of the Lebanese Christians in this country don’t want the Syrian Muslims, either. It seems unfair to discriminate against all Muslims, when a very tiny percent of the world’s 1.6B Muslims are involved in terrorism. It seems doubly unfair when almost all acts of terrorism in the US are perpetrated by Christians: Oklahoma City, Newtown, Austin, Littleton. And oh yes, Lafayette. There was an unsettling irony in our comparatively small terrorist attack: a Lebanese community leader, a relative of our current aforementioned Lebanese Congressman, was seriously wounded by a white, at least nominally Christian, terrorist. A man once said that trees are named for their fruit. It is as much a mistake to automatically exclude all Muslims as it would be to automatically absolve all Christians. We, each of us, deserve to be judged by our actions, and the content of our character. We definitely need to be cautious who we let into the US. But how can we claim to be the leaders of the free world, and then close our doors to people who are asking for nothing but freedom? Freedom from fear. Freedom from oppression. 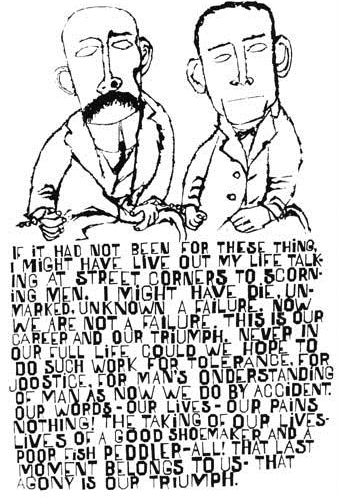 Pictures this page: Sacco & Vanzetti by Ben Shahn, courtesy of WikiArt. Front page print, courtesy Harvard Art Museums. 1. ↑ Added 2015.12.18: I got some push-back about the word “smelly.” It’s not the same as ‘stink’, it simply suggests a smell that is “off”, i.e., foreign. My grandmother smelled faintly of onions, thyme, and sometimes of the pungent cheese she made. She was a very clean woman, she just smelled different from other Americans. If you don’t like the exotic, you might have found the smell offensive. My initial thoughts are that all the folks who don’t want Syrian immigrants here need to have their Iphones and IMacs and other assorted I toys (or for that matter, their Apple stock) confiscated but I fear the lesson would be lost on them. Actually, it was lost on me. I had to look up Jobs on Wikipedia to figure it out. I had no idea Jobs’s biological father was Middle Eastern. As a country founded and built on the basis of immigration, I don’t think the current fear of Syrian immigration is based on a general fear of immigrants. The fear is the inability of our government to state with certainty that any of the Syrian immigrants will NOT be (or become) terrorists. The recent shootings in San Bernadino CA provided an example of this … the woman involved in the shooting was admitted to the country, and yet appears to have already been radicalized before entry to the US. Even a very very small percentage of terrorists in a large number of immigrants is a non-trivial number of potential incidents. Of course, there is no possible way to ensure with 100% certainty that any immigrant will not enter the US and commit crimes. Never has been, never will be. As I note, American terrorists are more of a threat to America than Islamic terrorists. With that, every immigrant group, regardless of religion brings in people who are, or who become, criminal elements, and those lead to deaths. My suspicion is that you personally are not worried about non-Islamic immigrants. But look at the background against which this has happened, amidst concerns about other immigrants. I heard one commentator note that after 9/11, we did not see the fear of immigrants we see now. There are some who believe the current anti-immigrant stance is not a product of rational thought, but of a media that has found great profit in divisiveness.